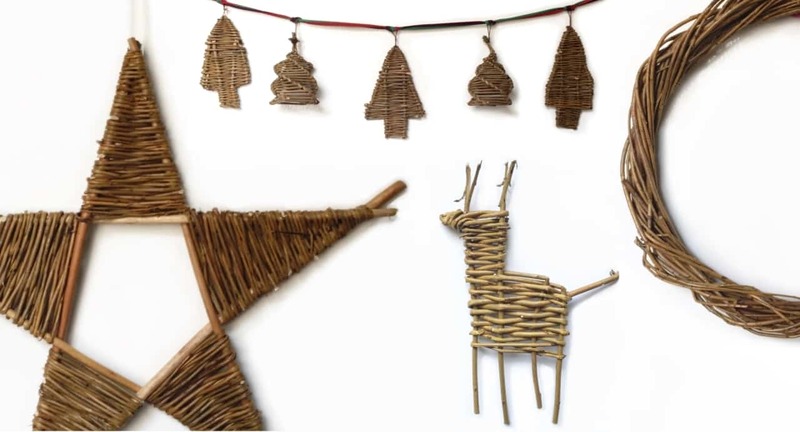 Fill your home with natural wonder this Christmas with a beautiful collection of handcrafted willow decorations. This workshop is a rather special opportunity to work with both of our experienced willow sculpture tutors, making a selection of decorations which can be displayed with pride in your home or gifted to friends and family. Join us for a fun-filled day where you will spend the morning with one tutor and the afternoon with the other, learning various ways of creating willow decorations. Once you have been guided through the making process of each design, you can decide which designs to focus or how many of each you make in the time available. It will be a very fun and creative day. The willow decorations you will have the chance to make include; reindeers, stars, trees, and spirals for hanging individually or for making into a garland and also larger stars and circles that are perfect alternatives to wreaths. The workshop will run from 10.00am until 4.00pm and is suitable for complete beginners. All materials and tools will be supplied – including a workshop apron for you to wear during your day – however if you have your own secateurs, please do bring them along. As with all our workshops, there will be a pause for lunch during the day which is also provided. This workshop is limited to 16. Visit www.threelittleigs.eu for more details.